The Ark of the Covenant is a precious fragile replica so we asking for $20 shipping and handling to ensure delivery. 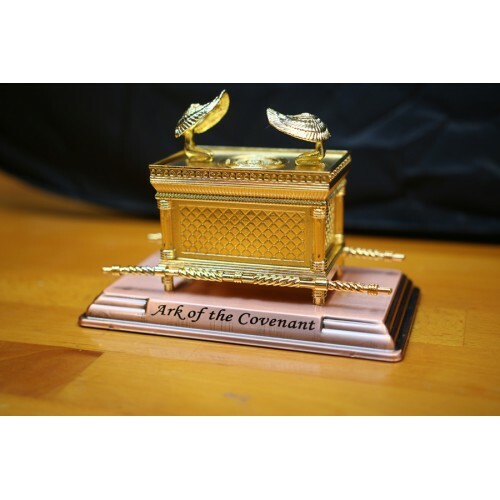 The Ark of the Covenant is a beautiful tribute to God's faith. This Ark is the visualization of the Ark that was constructed by the Israelites during their wanderings in the desert. The Israelites used the Ark from the time of its construction until the First Temple was destroyed. Considered to be one of the Jewish faith's most important symbols, the Ark is the only physical manifestation of God on earth. This replica Ark features gilded, gold detailing. Each side has two rings with a pole running through it. When the Israelites carried the Ark, the family of Kehath used the poles to transport the it while they crossed the desert. On top of the box is a kapporet. The kapporet, or covering, is removable and features two cherubs facing each other with their wings touched between them. Place a copy your favorite scripture inside for safekeeping. The Ark of the Covenant is one of the most sacred objects in the Judeo-Christian religion. Bring this figurine home to display on your mantle, desk or bookshelf. Or, give it as a gift.